Adams Heating and Cooling is the source in Kalamazoo for air purifier installation, air purifier repair, and maintenance of your air purification system. These systems can include air cleaners and UV lights. What is the purpose of air cleaners and UV lights? Air cleaners remove up to 98% of particles down to one micron. They negatively charge particles as they pass thru filter causing them to stick to the positive side of filter. UV lights kill odors and harmful mold and bacteria. They use ultra violet light to purify the air. Air purifiers and air cleaners are important because things like dust, pollen, and pet dander can act as allergens, triggering allergies in sensitive people. Smoke particles and volatile organic compounds (VOCs) can pose a risk to health. Exposure to various components such as VOCs increases the likelihood of experiencing symptoms of sick building syndrome. Additionally, with the advancement in technology, air purifiers are becoming increasingly capable of capturing a greater number of bacterial, virus, and DNA damaging particulates. Air purifiers are used to reduce the concentration of these airborne contaminants and are very useful for people who suffer from allergies and asthma. 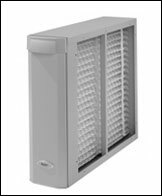 What air purification maintenance is required? Air cleaners need filters replaced on yearly basis. UV lights need bulb replaced every 3 years and bulb needs to be wiped off yearly. Adams Heating and Cooling can help you with all your Kalamazoo air purification needs. If a new air purifier is what you need, Adams sell Aprilaire models 2210, 2410, 4200, 4400, and 5000.